What better way to help celebrate the return of Guilliman to the 40k universe then an awesome conversion and paint job on the Horus Heresy version of himself. 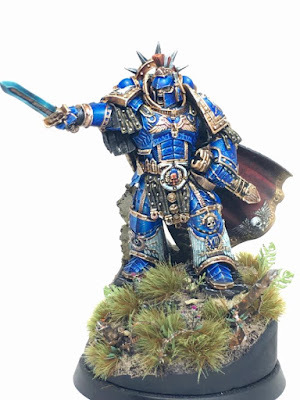 Mathew Kane is no stranger to the Mini of the Week, with one of his Ultramarines nearly winning Mini of the Year for 2016. He's back again with a completely stunning rendition of the Ultramarines Primarch. The conversions on this are extremely subtle and fit right in with the existing look of the model, which to me are the best type of conversions. This looks like it could have been an alternate version of the model straight from Forge World. The inclusion of an open faced, spartan style helmet really helps tie Guilliman into his Greco-Roman roots. It also has the benefit of making him look more war ready while still letting you see his face. Even more subtle, his leg has been slightly repositioned, which meant a lot of resculpting. The other obvious inclusion is the leopard pelt on the cape. Again, this helps reinforce the ancient Roman feel of the model, and also gave him an opportunity to paint on some stunning freehand. The painting on this model is incredible all around. The blue of the armor is super saturated and really draws your eye into the model. It has some really nice blending and reflections on it too, really pushing the contrast in just one color. The freehand is amazing across the whole model. The leopard pelt really looks like a leopard pelt and the designs on the cape are outstanding. I think the thing that impresses me most about the freehand is actually the very subtle pattern painted on the black side of the cloak in grey and the same on the red side. It does a good job of making the fabric look extravagant and luxurious, befitting of a Primarch. 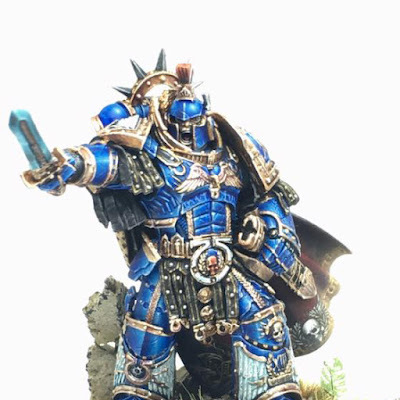 All around, this may be my favorite rendition of Guilliman yet. 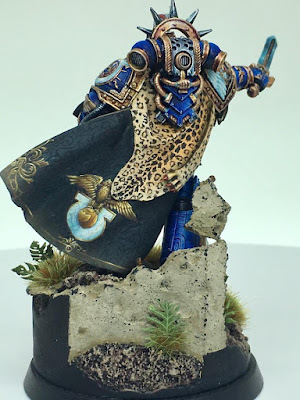 Be sure to click through to his Painting Facebook to see more views of him as well as the command squad the he entered with Guilliman into the Heresy Golden Demon, earning him the Gold in the squad category. Be sure to check out more views of the model on the MKA Painting Facebook Page.